With the summer in full swing here in the northern hemisphere, many of us are seeking relief from stifling temperatures. In some regions new record seasonal highs have been recorded; here in Toronto the past week was a true scorcher. 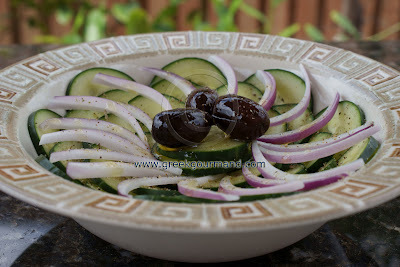 Fortunately, Greek food culture includes recipes that are perfectly suited to beating the heat. When Greeks sit down to a summertime meal, they will invariably include a raw salad of one kind or another. One of the more popular summertime Greek salads in our family is the world famous Aggourosalata (ah-goo-roh-sah-LAH-ta), or, Cucumber Salad. There are a few variations on the theme, but it is a very basic dish and serves as a refreshing course alongside other summertime favourites. 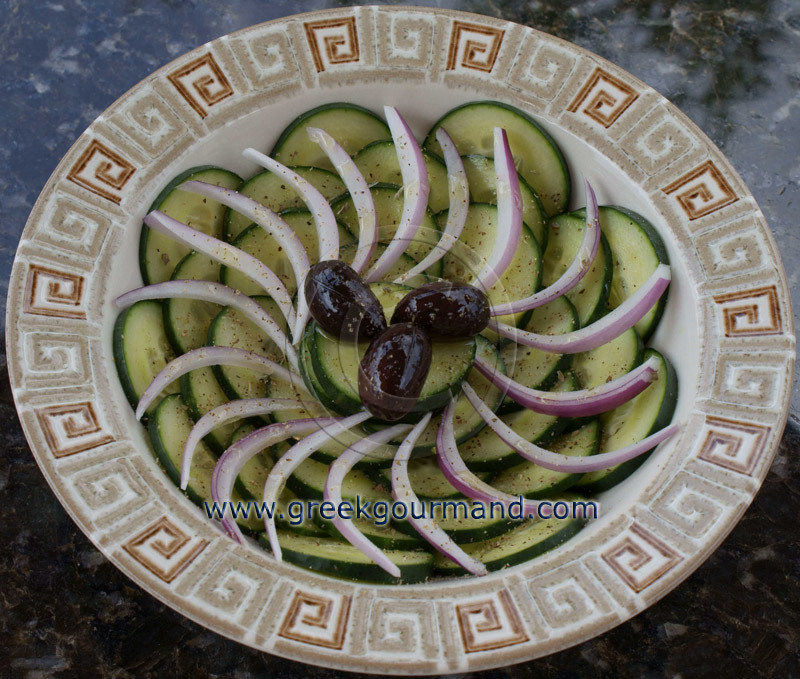 The cucumber has been α part of Greek cookery for millennia. It is used in the famous Tzatziki sauce, and can simply be sliced into wedges, salted or not, and consumed without any fuss, much like a melon. Indeed, a little known fact about the cucumber is that it is not a vegetable; it is actually a melon. Ancient Greek melon patches included the long green fruits alongside more recognizable spherical varieties. Today, alas, cucumbers are found among the vegetables in market produce sections, which can cause some confusion regarding their genus. Fortunately, a few of us are familiar with the old ways and can serve to remind others of our forgotten Greek food heritage. Salt and fresh ground black pepper; to taste. In a large bowl, combine and toss all the ingredients together. Serve immediately.